Tuesday, November 3, 12.05 am…one of the mothers in the nursery WON’T STOP BARKING. 12:15 am…I went out there to see what the trouble was. 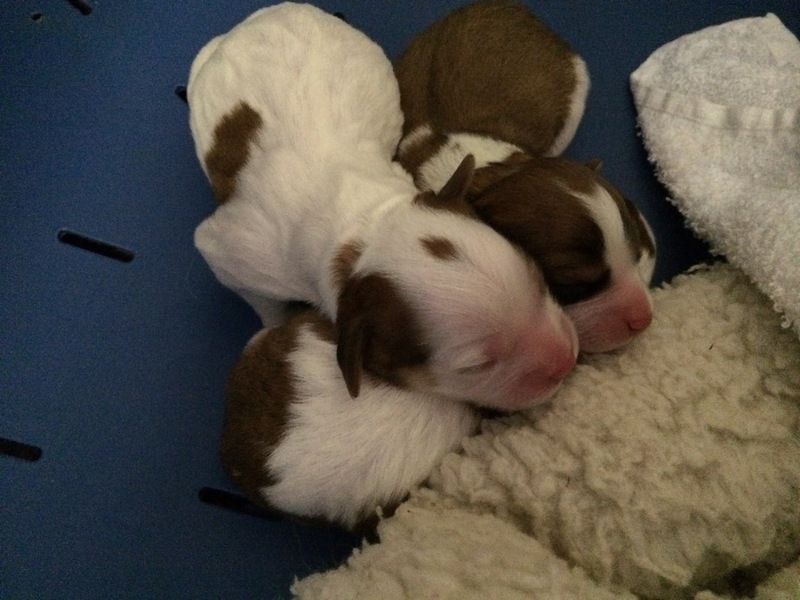 Puppies are due, so I figured I would find puppies born. Likely the noise was another mother barking at the one giving birth. But all I found was a nervous mom, digging in her litter box and nesting in her wheping bed. No visible contractions. Temperature 100.5, not a soon to deliver puppies temp. 1 am…I went back to bed but the dog started barking again as soon as I left. I was not interested in getting an email from the neighbor regarding the noise. We had to figure out something. 1:15 am…Hubby said he’d go out and sleep in the nursery. So he did. Dogs were quiet once he was out there. 6am…hubby already back in the house, still no puppies. 8am…I ran out to check on the nursery before heading out to work. Pre-labor mother having dry heaves. This was not normal. I felt concerned. 8:15am…I asked my boss if I could quickly slip out at 10 to go home and check on the mother-to-be. He said yes. 10:15 am…mother still hasn’t delivered, no visible contractions, still vomiting spit and bubbles. She actually seemed in good spirits though, not lethargic at all, and still very energetic. 10:40 am…head back to work, but call vet regarding the situation. They said if nothing changed by noon, I should bring her in. 10:45 am…back at work, asked boss if we could rearrange afternoon schedule to accommodate my taking my mother dog to the vet. They gave me the flexibility. So thankful for a job that understands the need for me to drop and run at times. 11:45 am…back home to pick up mother, head to vet. 12:15 pm…arrive at vet, drop off dog and sign all paperwork regarding tests, blood work, and probable c-section. Due date was Oct 29. Babies need to get out!!! Dog finally has several visible contractions. Maybe she’ll have these babies after all! 12:30 pm…run into market to pick up last minute items for evening meeting appointment regarding stuff for my daughter’s school. 1 pm…head back to work. 2 pm…receive phone call from vet. They are doing an emergency c-section. I am hopeful something might still be alive inside mama, but I’m prepared for the worst. 2:45 pm…head home and prepare food for evening meeting potluck. Do a few chores around the house. Rest for a few moments. 4:30 pm…receive call from vet. Mama and puppies are doing well. Puppies?? I’m amazed and delighted we have puppies. I didn’t ask about colors or genders or numbers. 5:00 pm…leave for vet. Pick up mama dog and 3 beautiful babies. She only had 3. They were all alive! Apparently the biggest one was blocking the way and wouldn’t come out. Poor little mama, but she was resting peacefully in the crate and the puppies looked perfect and strong. 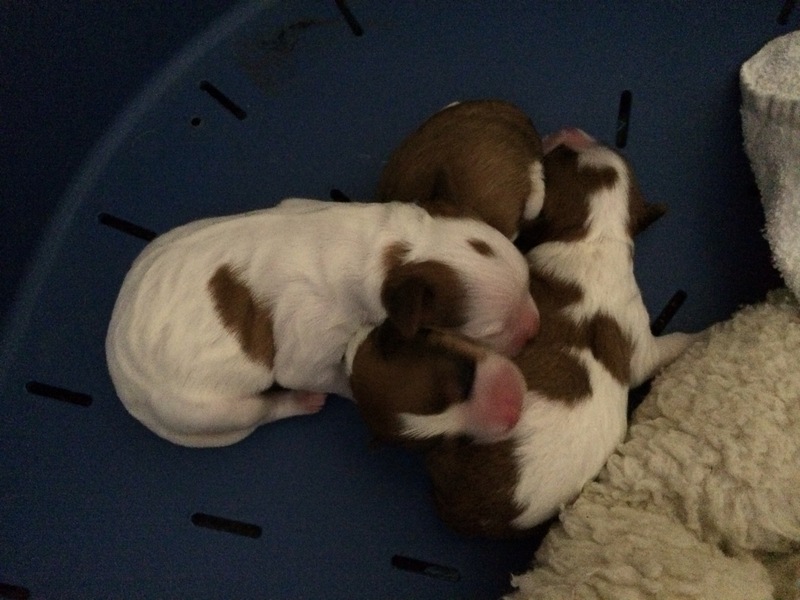 5:30 pm…get home and settle mom and babies into 1/2 bath with space heater and cozy whelping bed. Marvel at how beautiful the babies are, check genders, and feel very thankful for modern medicine that saves lives. Oh goodness……so glad they are all doing well!! I am so happy that they are alive and safe. We would like to see their pictures soon. What an amazing story! Every day I thank the Lord for the two little miracles you helped bring me that bring such joy to my life. God bless! You must be exhausted! Sounds like a really stressful day. Glad to hear mom and pups are doing well. Christy, I’m so happy that all went well. You and your family do such a great job with these little angels. Sending good thoughts your way! So glad to hear that both mom and puppies are doing well. They are so cute.